Samantha Raven has left her fans in the East Village. This raven was never expected to be able to fly from the historic and eccentric Marble Cemetery on Second Street. So people have been worried. But she’s more than fine: she’s now free, having flown away. What I didn’t want to say when I’d mentioned Samantha earlier is that she actually came from out west. I talked to the man who found the injured bird in either Idaho or Wyoming in about 2008. He took her to two vets and both said she had a broken bone and could never survive on her own. 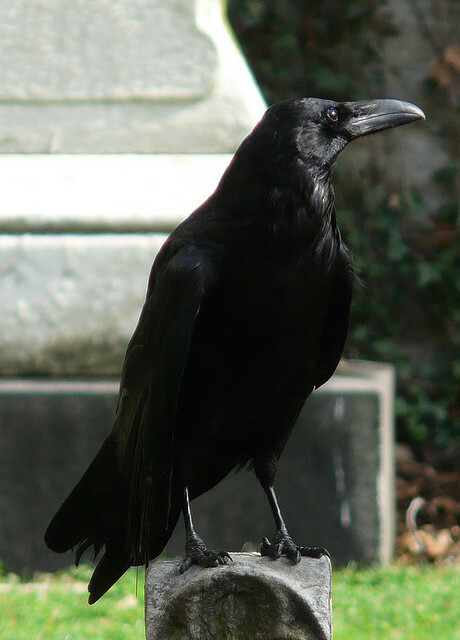 The guy had a soft spot for corvids, so he flew her back to his NYC apartment, which had a backyard abutting the cemetery. I didn’t want to say it because moving wildlife around like that is generally frowned upon because they could carry disease or non-native genes. Here’s the most amazing thing about the story for me: I had to go through all kinds of crap to get my completely legit dog on a plane and yet some airline let a guy put a “pet” raven under the seat. Eventually Samantha got good enough at jumping that she hopped the fence into the cemetery. The people who tend the graves are quite compassionate to animals (they feed the squirrels and let my ailing dog Jolly lie on the grass to watch them). Once they realized she’d never find a better place (with a rehabber, she’d have to live in a cage), they let her stay. The cemetery dates back to 1831 and has buried mayors, governors and President James Monroe (though a few years later the state of Virginia got annoyed at some monument and got the body back). Three wall are stone, one is an impressive iron fence that faces Second Street and in between is a rare piece of Manhattan grennery, dotted with vaults and monuments with fanciful Victorian era names. Everyone’s favorite is Preserved Fish, who was a shipping titan. The volunteers helped feed Samantha and only grew uneasy when she started picking off their pigeons. Samantha begrudged the man who saved her and would hop to the other side of the cemetery whenever she saw him. 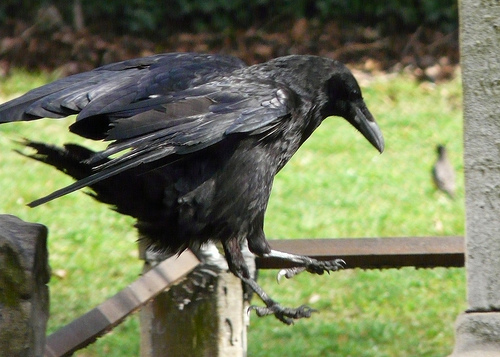 Corvids are social and chatty, so isolation could be hard. But a flock of crows seemed to regularly visit her. I hadn’t seen Samantha for a while and asked local wildlife photographer Dennis Edge. Dennis said she gradually got better at hopping and flying and just took off on her own. She was last seen on a rooftop almost a year ago. Everyone’s hoping she’ll join the Ravens that live in Queens and Westchester County. I personally enjoy the sanctity and sanctuary of a peaceful cemetery.